A STONE'S THROW TO DOWNTOWN! So COZY! You enter this lovely home to a sunporch with fun painting details. The living room is very inviting and offers plenty of seating. The sofa is a sofa-sleeper and has a new memory foam mattress (if needed). The living room has beautiful new wood floors & has a 40' flatscreen television equipped with local channels and cable. Wi-fi. DVD player and home stereo is connected to the television. The living room also has a lovely dining table that is set up for 6 but can be accommodated for 8. The kitchen offers many comforts of home and when you need groceries, City Market is less than a mile away. There is a kitchen nook with a table for four. The outside deck also offers a table, so depending upon the weather, there are many options for your dining pleasure! There are 3 bedrooms ~ 1st bedroom has a queen bed. The 2nd bedroom has a queen bed and closet. The 3rd bedroom offers a trundle bed with 2 twin mattresses. The full bathroom is centrally located in the house and has Colorado wildflowers painted in the colorful hallway. Laundry room is off the kitchen in the back of the house. Beautifully landscaped in the summer with many wildflowers blooming in the front and back. Side yard offers a picnic table under the shade of a large tree. You should find this house to be a comfortable place to call home for a night or a month! Come and STAY with us! My husband and I are both from the mid-west (Iowa and Illinois) but we met in Fort Collins, Colorado while attending Colorado State University. After graduating, we moved up to Big Sky, Montana for 4 glorious years where we skied all winter and rafted all summer. We then moved to Grand Junction in 2002. We love the Grand Valley and all that it has to offer. We are 45 minutes, doorstep to doorstep, to Powderhorn Ski Resort and the Grand Mesa. We also love the proximity to all of the different mountain biking systems in the valley and hiking/trailrunning opportunities as well. The Riverside bike trail system is about a mile away and from there you can bike along the river east to Palisade or head west all the way to Fruita. We also love downtown Grand Junction because of the street art (a must see), restaurants, bars, farmer's markets, weekend festivals, the Avalon Theater and shopping just moments away. Please contact me with questions about the area! We choose this property because of it's downtown location. The 1900 home is so charming and comfortable and has lots of character. Feels like home! Downtown home minutes away downtown art, entertainment and fun. Enjoy the many restaurants, shops and newly renovated Avalon Theater 2 blocks away. Famous Enstrom's toffee on 7th and Colorado. Garage is there but just for storage at this point. Sofa-sleeper in living room with memory foam mattress. Linens in front bedroom closet. Back covered deck with bench and table seating for 6. We thoroughly enjoyed our visit to Grand Junction and this was a great home base for our time there. The house is fun, comfortable, and homey feeling. It’s close to downtown and walking distance to good restaurants and fun shops. The house was so cute and cozy and fit all of us comfortably. We especially loved the colorful porch where we could sit and visit in the evenings! Thanks for a great stay!! Close to everything in Grand Junction. Cool retro home. Perfect for us! Our stay was brief but very happy with accommodations. We stayed there for a swimmeet at CMU. Was so much more relaxing than a hotel! Thanks Cyndi! We felt right at home in this very charming house. We loved cooking breakfast in the fully appointed kitchen and eating on the back porch. Thanks to the hummingbirds and finches for sharing your space! The decor is delightful. We would love to stay here again. 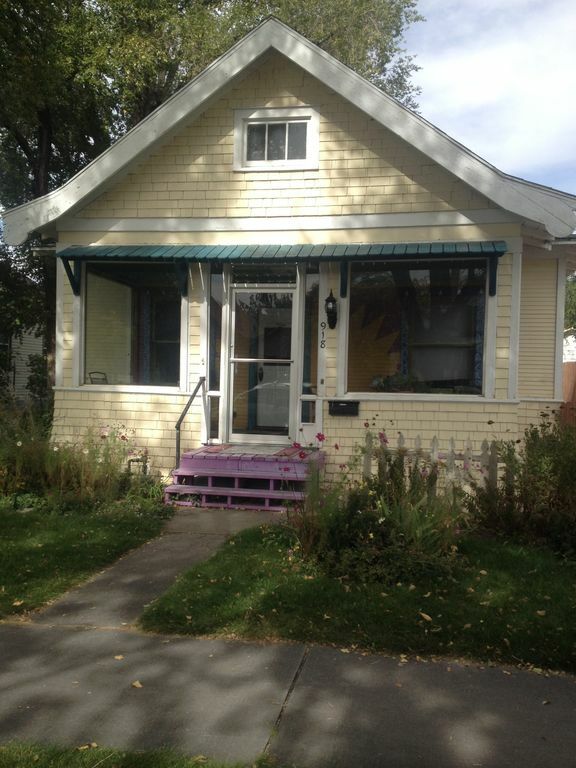 Located just minutes (walk) from downtown Grand Junction. Newly renovated Avalon theater just moments away. 1 block from Enstom's famous toffee and coffeeshop. 8 blocks from Lincoln park, pool, golf and Stocker Stadium. 15 minutes to Palisade fruit and wine country. 15 minutes to dinosaur museum and world famous mountain biking in Fruita, CO.
Every stay at our home requires cleaning. The fee for this service is $75. If you stay over one week, we will do a weekly cleaning, $75 per cleaning. I'll change sheets, wash towels, clean floors, wash dishes, take care of trash and recycling, clean kitchen & bathroom (and whatever else needs attention). Check in time is 4pm. Check out time is 11am. I can sometimes be flexible with these times so please ask if you need.